Chart-topping test results make this SATA SSD a worthy laptop or PC upgrade despite occasional small performance dips. 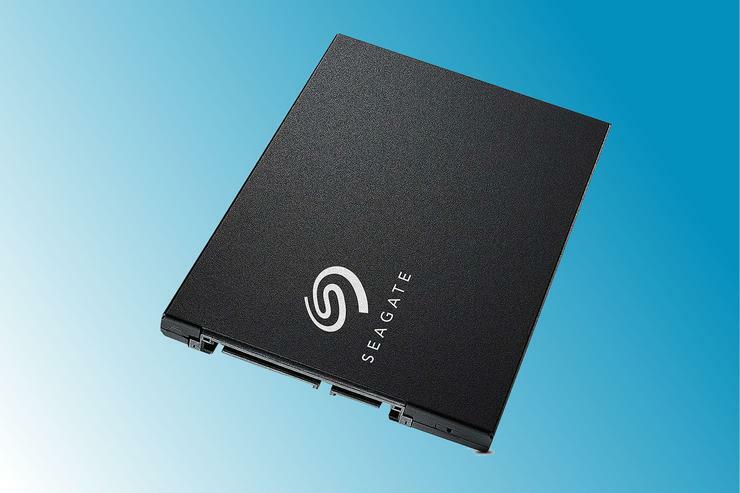 Seagate’s name alone will undoubtedly sell quite a few Barracuda SSDs. That’s a good thing, as it’s a very affordable drive that delivered some of the best test numbers of any 2.5-inch SATA SSD we’ve ever tested. However, there were occasional minor performance dips and lags that we’re not necessarily used to seeing in an SSD. The Barracuda SSD’s SATA 6Gbps interface and 2.5-inch drive size tells you most of what you need to know—there’s simply not a lot of deviation in the breed. But the 1TB version I tested is only 7mm thick and weighs a mere 50 grams. Thin and light are nice when you’re trying to save weight in a laptop SSD upgrade, but meaningless when it comes to desktops. The NAND is 3D TLC. Seagate has not gotten back to us with key information such as the exact type, the controller, or the amount of TLC treated as SLC/MLC for cache. By the results of our tests, however, I’m guessing the latter is around 1.5 percent, or 15GB. 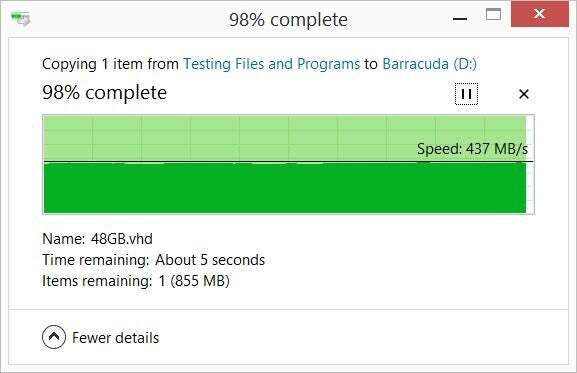 The Barracuda is one of the new breed of TLC drives that sustains writes at close to SATA 6Gbps maximum (around 450MBps in Windows copies), no matter how much data you throw at it, so the cache isn’t quite as important. Early TLC SSDs could sometimes nose-dive to hard drive speeds after running out of cache. 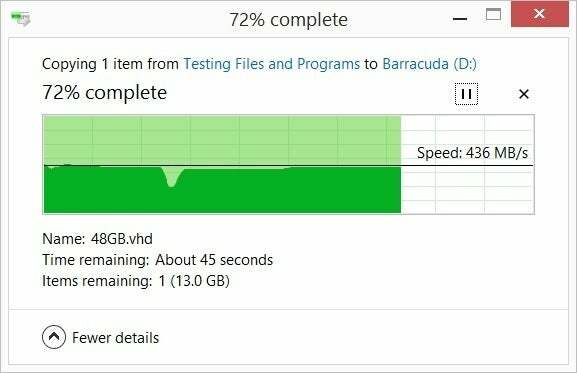 The Barracuda SSD comes in other capacities besides the 1TB/$225 we tested: 2TB for $450Remove non-product link, 500GB for $105Remove non-product link, and 250GB for $70Remove non-product link. The drives are reliability-rated for right around 1TBW for every 1GB of capacity, which is par for the course. 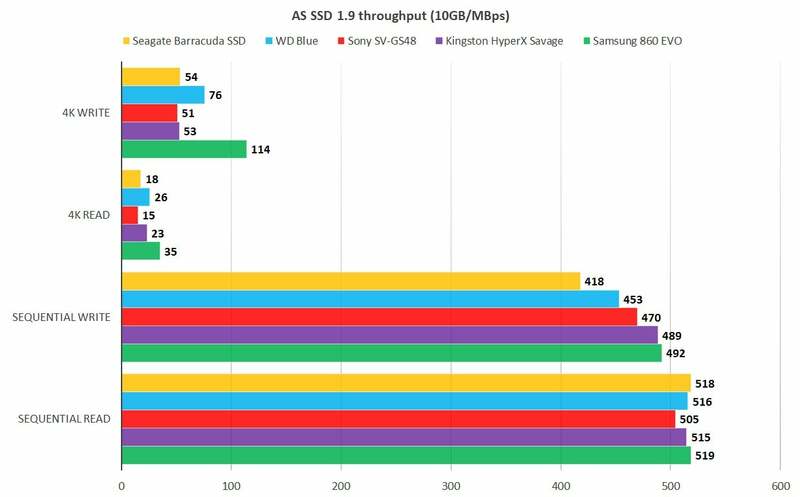 Some vendors, such as Intel and Sony, are upping the ante significantly in terms of TBW rating—for twice or more the price of the average mainstream SSD. The actual warranty period of the Barracuda SSD is a generous (for the price) five years, though if you slam the drive into a busy file storage server and exceed the write rating by a large degree, the company might take issue. Excessive NAND wear (there are counters on board) will raise a red flag, while controller failures, though exceedingly rare these days, are usually forgiven. 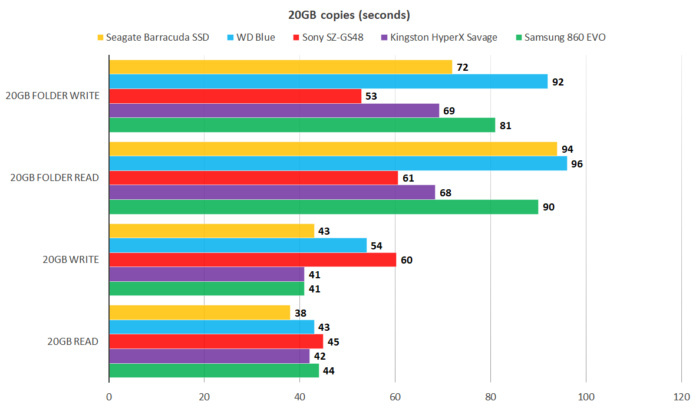 Nearly all our numbers and most of my subjective experience indicate the Barracuda SSD is a top performer. The first chart shows the numbers granted by CrystalDiskMark 5, first by mimicking the random opening and loading of small files (something Windows does a lot of). The sequential numbers show the speed with which the drive sustains reads and writes with larger amounts of data. The Barracuda (gold bars; longer bars are better) clearly excelled at sequential reads and writes, and it did well in the random tests as well. CrystalDiskmark 5 thought highly of the Barracuda’s sustained throughput. It is, indeed, quite good. Longer bars are better. Note that the 860 EVO will slow down considerably once it’s off cache, which makes its numbers in the CDM 5 chart a bit deceiving. However, another test, AS SSD 1.9, showed lower performance from the Barracuda with the 10GB data set (which is more stressful on the cache) than with 1GB of data . Actually quite a bit lower than what we saw in our copy tests. It may be that one of the drive’s occasional strange dips (more on that in a bit) occurs just at the end of the test. Watching the sustained write numbers decline, it certainly seemed that way. AS SSD didn’t like the Barracuda as much as CrystalDiskMark 5, but those are still decent scores. Longer bars are better. Our real-world large data set transfers, shown below, use Windows copy-and-paste and mimic what you see when copying large movie files, for example. (Yellow bars again; shorter bars are better.) While not particularly ace with the 20GB batch of files and folders, the Seagate Barracuda did quite well with the large single 20GB file. 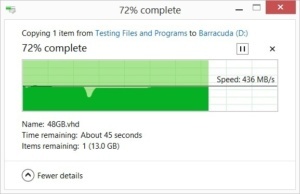 The Seagate Barracuda (gold bars) was fast overall in our 20GB copy tests which are a reflection of what a user might experience when moving large amounts of data. They also show how well the drive sustains writes. Shorter bars are better. Occasional small hiccups occurred while copying files to the Barracuda. But there were also other oddities in performance, such as a format that took almost five times longer than normal. Other dips included super-low numbers on several runs of Blackmagic’s Disk Speed on a Core i7-3770 iMac, before recovering to normal for subsequent runs. The oddest occurrence was a 90-second re-format (after returning from the Mac)—a multiple of what I see with most SSDs. Odd, at least, until Seagate explained that the entire drive undergoes a TRIM when a format occurs. That still seems a bit slow, but formatting is a one-time thing for most users and not worth worrying about. Sometimes the Barracuda didn’t hiccup during copy operations. But it did it often enough that we re-tested with extra steps, such as installing it in a Mac. Seagate also sent a second drive for testing. While the occasional slowdown is a head-scratcher, in the overall picture it’s more quirky than debilitating. Sort of like a race car leading the field, stopping for a new set of tires, then passing all the same cars again. Subjectively performance was very snappy the vast majority of the time. Note: We retested with a second Barracuda that Seagate sent us, with largely the same results. If I hadn’t experienced the Barracuda’s minor glitches, I would quite likely be sitting here telling you that it’s the best thing since sliced bread. It quite likely still is, as the drive makes up for its occasional foible by being a bit faster during transfers than other drives. Ultimately, the Seagate Barracuda will probably save you a wee bit of time, but the competition offers a smoother experience. Your choice will probably depend on your personality type. I found the little dips a bit unsettling.